Afshin is formally trained in cello, piano and violin but cello is his instrument of choice. Therefore he continued learning cello in the advanced level at The Royal Conservatory of Music of Toronto. In addition, he passed the music theory, solfege and general piano courses. Afshin’s special attention to the production of music for children resulted in a music album is titled “Childhood Desires” as an effort to simplify some of his rock/metal favorite songs by rearranging them into minimal and relaxing pieces using Orff instruments. He was convinced to push this project a step forward, and compile the book “Childish Minimals”. His attempt was to arrange some of the songs from the above album in a yet more simplistic style, compared to the album with no key signatures, so that kids could easily play and enjoy them. 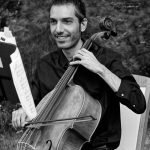 Afshin has over a decade of experience in teaching cello from beginner to advanced and violin/piano from beginner to intermediate students through group/private lessons providing comprehensive music instruction to students and participating in performances, recitals, and community events. Usually he has some creative and interesting methods and ideas himself to teach specially for the young kids and children, but depending on the instrument he uses his preferred methods e.g. for cello Suzuki/Dotzauer, for violin Suzuki/Le violon and for piano Beyer/Hanon methods although he can easily change to student’s request as well. Also as an official certified Orff instructor, he loves working with children and his mission is to introduce musicianship to them in a fun, creative way, to engage the children in the process of music making that they will enjoy. Afshin is an amazing teacher, he is very professional and talented. He knows how to find the right teaching approach to make the disciple feel comfortable and he is very patient in his teaching technique. I enjoy my learning experience with Afshin and I absolutely recommended him to my friends, who also want to learn. Lessons with Afshin are very effective.